The climate changes quickly from the summit-line of the Cascades eastward to the Columbia River. Annual precipitation drops rapidly and summer temperatures soar. 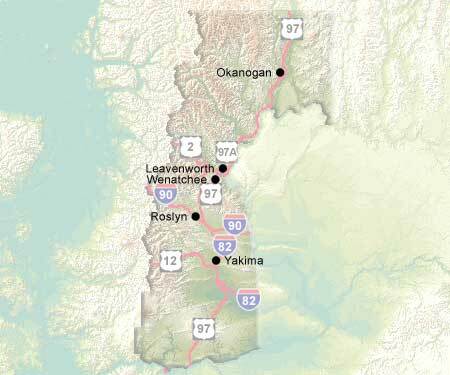 Within this transition area are three large cities, Yakima in the fertile Yakima Valley, Ellensburg on Interstate 90, the major route between Seattle and Spokane, and Wenatchee. The more northern regions are lightly populated, with well developed recreation at Chelan and opportunities to rough it in wilderness areas still farther north. Highway 97 is the unifying link for the region, running from the Okanagan-Similkameen region in Canada to Oregon and beyond.